Preheat the oven to 400°. In a small bowl, combine 2 tablespoons of the sesame oil with the garlic, ginger and soy sauce. 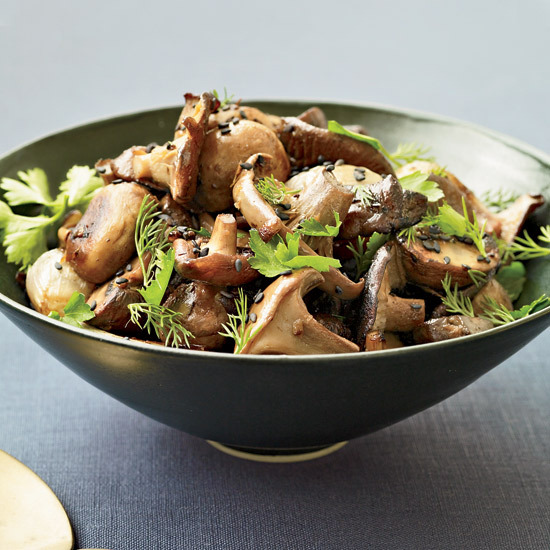 Spread the mushrooms on a baking sheet and drizzle with the garlicsesame oil mixture; toss to coat. Season with salt. Roast the mushrooms for about 30 minutes, until tender and glazed. The roasted mushrooms and shallots can be kept at room temperature for up to 4 hours. Reheat in a 400° oven before serving.